To effectively implementation of ISO 9001 / Quality management system in organization, management commitment is much important. More, management should involves in each major activity to effective and continual improvement. This article describes the management commitment for the quality management system in organization. Management must committed and responsible to implement quality management system. Because quality management system help, to enhance quality of product and work. As well help to effectively implement of time management in organization. The quality management system is helpful system that help to achieve more customer satisfaction by continual improvement. The Management team is find requirement of quality management system. The management is also responsible for understand existing system and review for find any improvement. The continuing suitability by reviews existing system, understand customer requirements. And improve customer satisfaction through internal quality management system. The management team is responsible for reviews of department wise objectives. Identification of company level objectives to focus on quality management system improvement. The management should be considered company level objectives, customer requirements, market status. To establishment the quality policy and reviewing it. For continuing stability, the established quality policy had conducted to communicating important customer requirements, statutory and regulatory requirements. Top management is responsible for identifying the key processes (Customer related processes, internal management system. Process realization procedures are considered as key processes or organization) are involved and effectively implementation in quality management system. For the managing all the required processes verification and its effective implementation needs to establishment of review team. That conduct all the concern processes of quality management system, to reviews and identify system requirements. Identified management review team conducting processes for identifying the input information, data & graph manage for effective reviews. The management team should be scheduling reviews and conduct the documents, processes to manage and implement as compliance of quality management system. The tam should be responsible for gathering information from various department. The reports and data from the responsible functions. And for ensuring adequate employee awareness of quality management system. The team should be conduct and reviews the information, monitoring on the progress report on actions assigned to them at management review meeting. Management team establish quality policy. Review its suitability during the monitoring and reviews meeting. The team should communicates the quality policy. Its requirements like employee orientation training, training requirements as per job, resources requirements. The management is responsible for conducting information and manages records of each key process in master list. And also documents of the product realization processes for monitoring and analysis the key processes. The management team managing records to monitoring and controls over the quality management system processes by monitoring measuring and analysis processes by managing records in the specific format. The format covered the process requirements, measurement frequency, planned measurement, function responsibility for measurement and analysis, and its methodology. The quality objective measurements and improvement targets are covered. 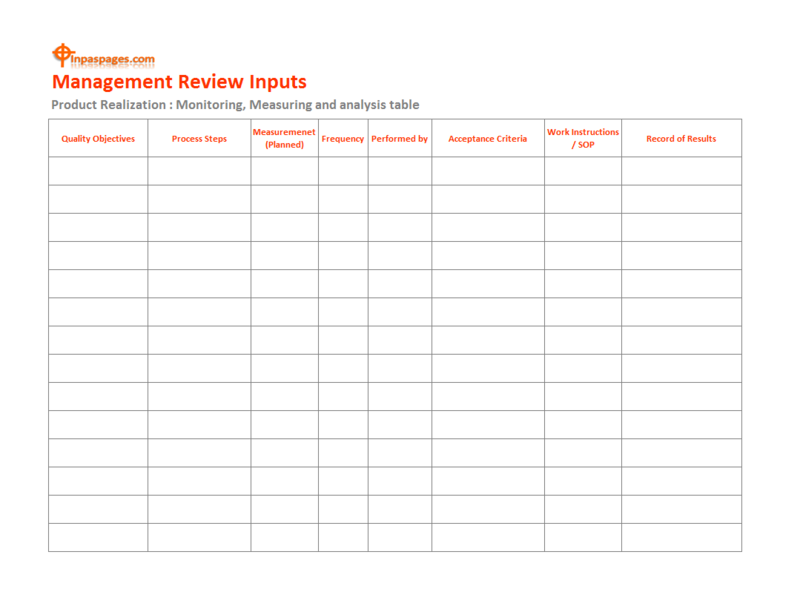 This format is help to conducting review processes to determine the improvement. The management will identify as table describing about product realization processes, monitoring and measurement. The result inputs form the reviews are used for the customer feedback. Assign further requirements projects to related personnel for concentrate concern meetings, communication with customers, and studies end application requirements. The management review team conduct “Management Review meeting” as per frequency defined. Or as generally conducted quarterly reviews to appraiser the continual improvement. Progress status of quality management system in satisfying the clause requirements of international standards system. The management appointee “management representative” is arranging the management review meeting. And responsible for manage all the activities related to quality management system. The management representative is responsible for collect the information and reports form various departments. Later on, M.R. will be discuss these reports in management review meeting. Normally, report details can be possible to include in the agenda of the meeting. Normally, during the management review meeting, each actions and its planning may be decided. Once the action planning is in implementation phase, management can frequently update these activities. They can also set the new quality objective based on existing status.